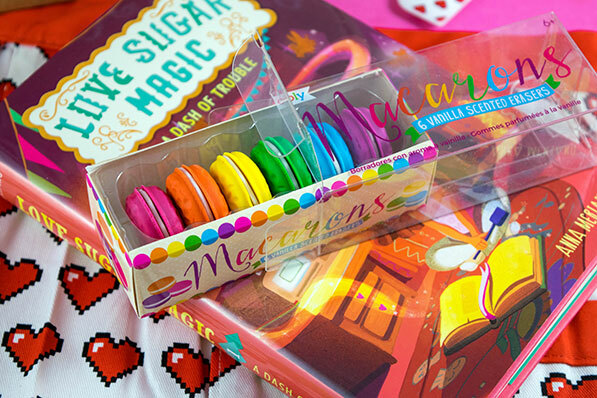 Bake Your Heart Out with the OwlCrate Jr. "Sugar and Spice" Box | YAYOMG! 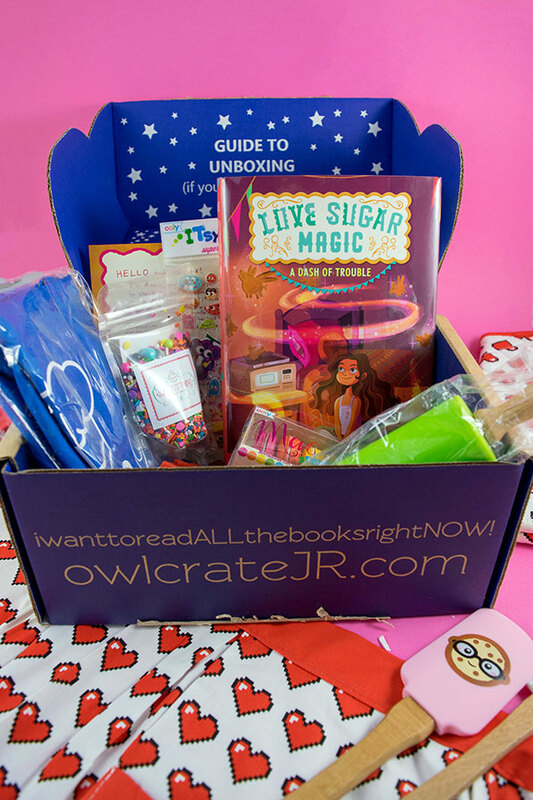 Kicking off a whole new year of delicious bookish goodness is the Sugar and Spice box from OwlCrate Jr. We know we say this what feels like every single month, but this is one of our favorite boxes yet! 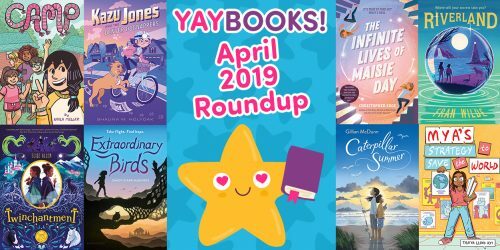 OwlCrate Jr. is continuously stepping up their game in terms of the amazing stories they’re sending out to readers each month and all the themed goodies that go along with them. This month is one of the most perfectly themed as well as the most delicious. This month’s read was one we’ve been looking forward to for quite awhile, so we were extremely excited to receive it in our box this month. Ready to find out what was in the first box of 2018? Keep on reading! 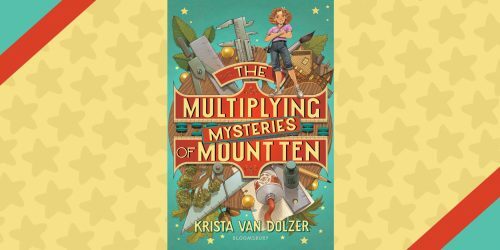 This delectably magical read is the first in a series, so if you love it as much as we did, there’s so much more to come! There’s baking, magic, a sprinkle of mischief, and a generous helping of family. We just know you guys are going to love it. Plus, look at that irresistible cover! 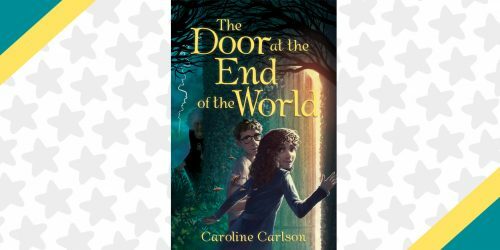 And when her best friend, Caroline, has a problem that needs solving, Leo has the perfect opportunity to try out her craft. It’s just one little spell after all…what could possibly go wrong? Also included with this mouthwatering read is some pretty awesome book swag. Subscribers received a handwritten letter from the author, a signed bookplate, and a recipe for the Dia de los Muertos specialty, Bread of the Dead. OwlCrate Jr. didn’t just supply a recipe, they included a few useful items to help you in your baking adventures. Stay clean in the kitchen and look fabulous while doing it! 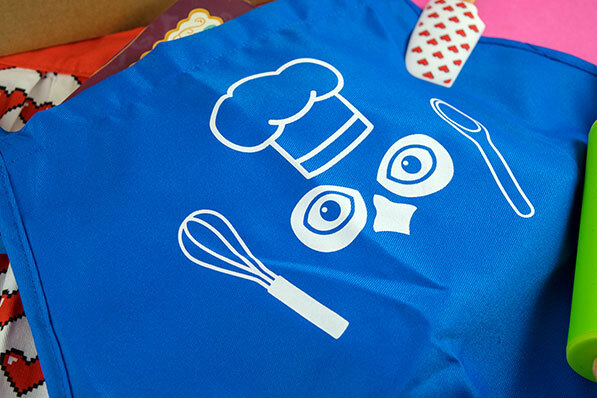 This bright blue apron comes complete with the face of the OwlCrate Jr. owl on it! Show off your OwlCrate pride every time you whip up something delicious. Plus, it has a handy pocket right in front to store recipe cards or cooking utensils you’re using while you get your bake on! 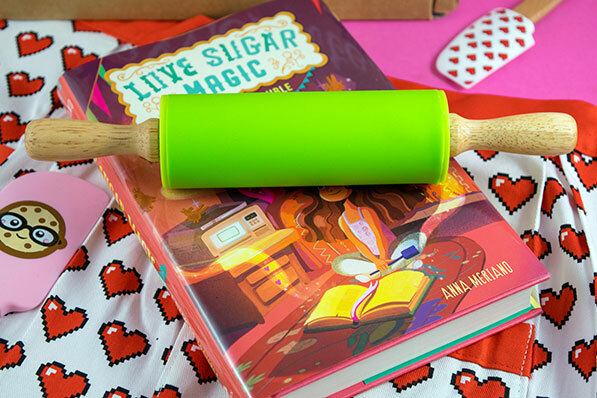 This rolling pin is perfectly sized for tiny bakers! It’s a little bit smaller than an ordinary rolling pin but just as useful. Use it to roll out cookie dough to make tasty cookies using the next item in the box. You can also use it to roll out clay! 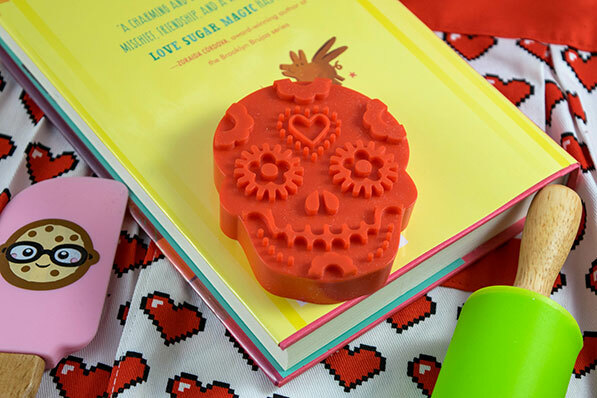 Tying in with the theme of the book is this Sugar Skull Cookie Cutter. Sugar Skulls are an essential part of Dia de los Muertos, and now you can bake your very own anytime. These amazing rainbow sprinkles are a custom sprinkle mix made exclusively for the Sugar and Spice box. 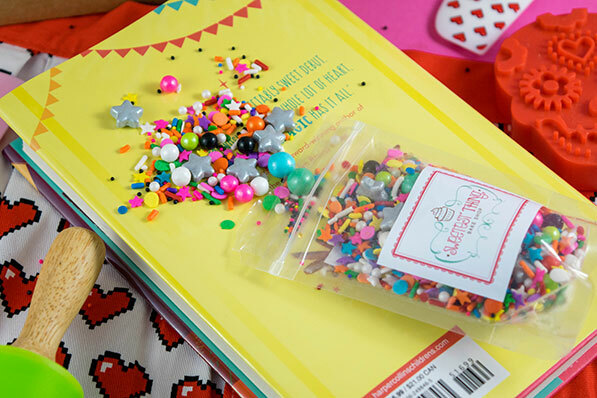 You’ve got yourself a bag of extra special sprinkles here! Before you use them on a sweet treat, be sure to snap a super cute spill photo for your Instagram! We can’t wait to sprinkle ours on cookies, cupcakes, or maybe even some unicorn toast. These erasers aren’t just exceptionally cute, they’re vanilla scented! Stash them in your backpack to make any mistake so much more fun (and fragrant) to erase. Speaking of cute, these food stickers are seriously adorable. We’ll definitely be sticking these all over our stuff ASAP. OwlCrate Jr. really impressed us this month with this perfectly curated box. The items went along with the theme even better than usual, and we were really excited to receive items that can be used in the kitchen again and again. What’s up next for OwlCrate Jr? Wild Magic! 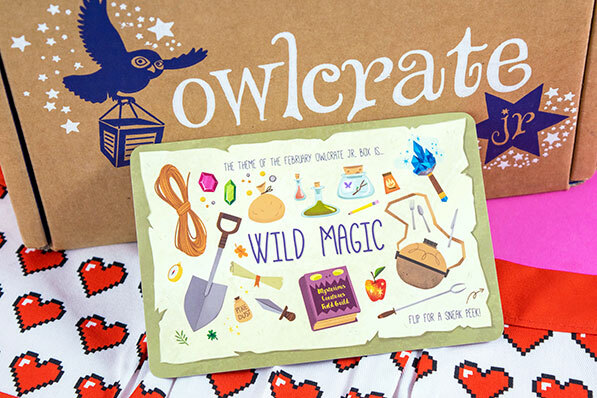 Head on over to the OwlCrate Jr. website! They’re still catching up from their insanely successful holiday season, so new subscriptions are still closed, but they’ve already started contacting people on the waitlist. If you’re not on the waitlist, you’ll have to wait a little while longer. 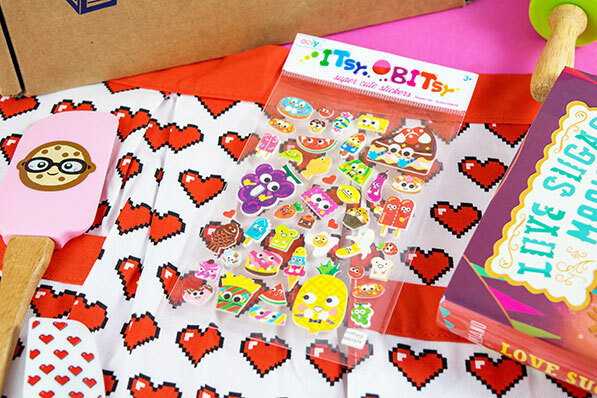 If you miss out on the February box, don’t fret – they’ll be adding a TON more slots in March and for future boxes to accommodate lots and lots of new subscribers. 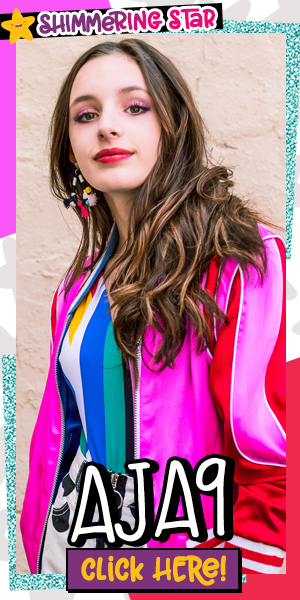 When you’re able to subscribe, be sure to use our discount code, OMG10, for 10% off your purchase. This code is good for both OwlCrate and OwlCrate Jr. boxes, so be sure to share it with any and all young adult and middle-grade readers you know! 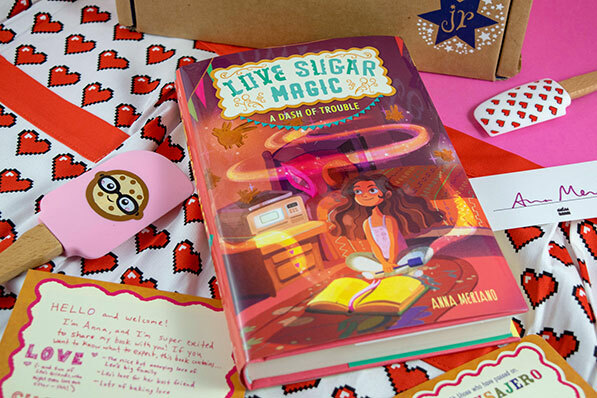 If you liked Love, Sugar, Magic, the book included in this month’s OwlCrate Jr., we think you’ll also love Smart Cookie by Elly Swartz. Check out our interview with the author!